It’s Santa Cruz Time! Woo Hoo! Man, oh man I do love this brand of bubbly pop. I just think the company is on the right track, you know. Read about their environmental commitment here. Aside from the goodness that they try to do I really like the ingredients they use for soda. I know, I know, why drink soda if it’s so bad for you. Well, you know what? I’m not perfect. There I said it. Sometimes I crave a soda like nothin’ else. So I try to at least put the better bad stuff in my body. Call me crazy, my mama does. 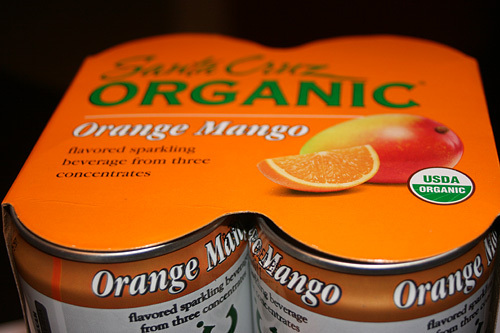 The ingredients for their Orange Mango Sparkling Beverage is as follows: SPARKLING FILTERED WATER, ORGANIC EVAPORATED CANE JUICE, ORGANIC MANGO PUREE, ORGANIC ORANGE AND ORGANIC LEMON JUICE CONCENTRATES, ORGANIC NATURAL ORANGE FLAVOR. I just love the fact that for sugars they use a cane juice instead of HFCS (High Fructose Corn Syrup) or any variation of that funky junk. As for the taste of this organic soda it’s sweet-tart-ish. I’ve had their Mango Lemonade and that, to me, tasted quite tart-like and this was close to that but sweeter. I liked it. Also the carbonation is not like a quick punch to your face. Trust me, there is plenty of bubbly stuff it’s just doesn’t take over the soda. Feel me? I find it at my local grocery store and it runs you $5 for a 4-pack. A little pricey, but check back on their website, they always have rotating coupons for their products. For other Santa Cruz Organic Sparkling Beverages I liked click here and here. I'm organic AND yummy AND not so bad for you!